it hits sometimes, with all the force of a dumptruck backing into your front hood (a force i recently felt firsthand). one minute you are tossing off your hazy dreams, the next your heart is pounding, your boy is running late, oatmeal is looking impossible, and the week is barreling at you. this was one of those mornings. oatmeal got into the boy, but only thanks to a styrofoam, toss-away bowl thrust into his clutches as he dashed past, stumbling into untied shoes, en route to carpool at the curb. the throbbing thing in my mouth kept up its 2:4 time. i realized, head spinning, we were out of the weekend zone of leftovers and chili made by someone else in the middle of the afternoon. it’s my turn again. to feed the boys. to wash their clothes. to get them where they need to be. to get me where i need to be. imagine that. and so, lumbering down the stairs, to unearth the frozen chicken breasts from their frosty slumber, i take in a deep, deep breath. i consider all the things that soothe me. i take account of what surrounds me for moments such as this. i consider soup, a tall slow pot of it simmering through the day. i consider the loaf of bread a wonder woman dropped by yesterday afternoon, hot still from the oven. i shoot a glance at my amaryllis, the one now neverminding a measly three blooms, going instead for homeplate, with four trumpets about to blare in all directions, north, south, east and west. i press my nose to the window. 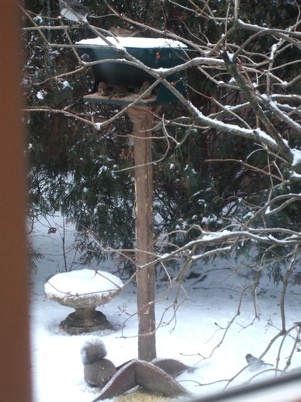 see the birds flapping and the squirrels chasing each other for the cookie i tossed out last night. i listen to the heartbeat of the clock, slow mine to sync with its. i pour a big tall mug of coffee, spiked with cinnamon, as always. i invoke the patron saints of everyday grace. i realize it’s my job to soothe these jagged nerves, the ones that are mine, and blessedly the ones of those who dwell here with me. it is a job i love, a job that i’ll get done with snippets of herbs on bowls of soup, with toasty bread, with more seed for more birds, with breathing deep and slowed. may every one of us this day find ways of stitching grace into the madness that is the monday morning slam. how do you soothe the dwelling place that you call home? do tell…. Thanks for the reminder that it is my job to soothe my own jagged nerves–and how jagged they are on this Monday morning! It is also my job to soothe and care for others so I must calm my frazzled self. I don’t have a strategy for this. An angel gave me a big cup of coffee this morning as I volunteered at my son’s school, and now I am home folding clean laundry with a thankful heart and trying to bless each room and each child as I move through doing chores. Deep breaths, more folding, a moment with the newspaper, all while listening to the very noisy birds of the morning–plus your wonderful words–this may do the trick. I have long been aware of how my mood, tone and choice of words set the tempo and tone for the day for me and for my family. Monday for us starts with my daughter’s piano lesson at 8 am( before school ) two towns away. We sometimes are finishing theory homework in the car! I have a little song that was taught to me ages ago….you start by saying/singing your name twice followed by “take your time go slowly, Listen deep within yourself, simple things are holy.” Say or chant that a couple times in a row….it brings me back to center every time. If not…go back to bed and try again later! my morning starts quite early, about half past 4, and i too spike the coffee with cinnamon. love it that way. and a dollop of honey, not too much, not too sweet, not to mask the caffeinated bitterness of the beans. the plunger pot steeps while i go about my morning chores, which include rubbing the belly of our 16-year old cat as he eats. he is wise and we have done this ritual now for five years without fail, and should i sleep late he awakens me – pokes me in the head or stands atop me like the lion king. this ritual sets the tone and tempo of my day, that is his wisdom, and there have been days when this ritual alone gave me the steadyness to go out into the day light. life now is better, easier for me, and for our cat, the prince, same as always he returns to the warm bed after our morning tete-a-tete. i go off into the darkness and quiet, and cold these last few days, making my way surrounded by metaphysical light that i send out to family and friends. these moments are blissful and the days unfold in their own way, comfortably. what do i know? i am neither cause nor effect. at best, merely i am. peace is, as i let it be.